A Doncaster based manufacturing business which specialises in the protection of doors, people and places is celebrating its silver anniversary this month. 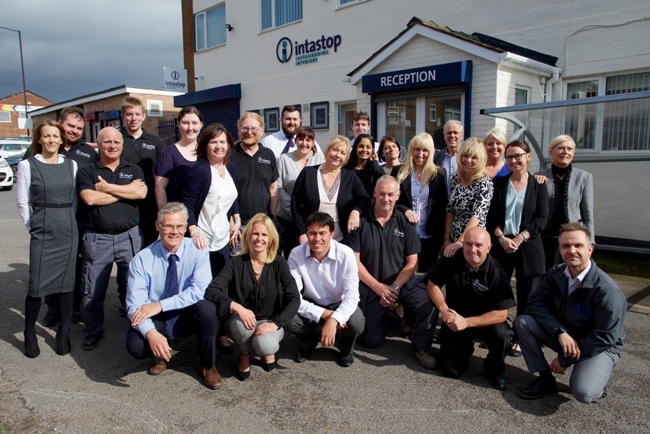 Established in 1992 by John and Marie Hills, Intastop opened the doors to the original business which, at that time supplied just one product, the Aluminium Door Edge Guard, which revolutionised maintenance programmes within the healthcare sector. “Intastop has enjoyed continued success and growth in its 25 year history and will achieve a turnover in excess of £4m this year,” said Sarah Barsby Marketing and HR Director Intastop Ltd.
Today shareholders of Intastop John and Marie’s, daughter Sarah and son in law Phil hold full time director posts in the business and together with a board of directors all work together to drive the business forward. It supplies a wide range of products to the healthcare, mental health, education, retail and leisure sectors and is proud to be the only UK distributor for American Company InPro IPC® Door and Wall Protection Systems. Sarah added: “Twenty five years is a very special anniversary and we are very proud of what we as a business have achieved in that time. Staff at the business are employed primarily from the local region and Intastop remains a significant local employer who supports the local community with its charitable efforts including the support of Hallam FM’s Cash for Kids campaign.